It has become increasingly common in the last few years to see animals in public places that were once animal-free. And while part of this has to do with society being more accepting of animals in general, most of the reason for the increase can be attributed to a rise in service animals and emotional support animals. Service Animal or Emotional Support Animal? There is a very real difference between service animals or emotional support animals. In order to qualify as a service animal, a dog is typically trained from a young age to assist a person who may have a specific disability. Some service dogs help as a guide for people who cannot see well, others are trained to sense when someone is going to have a seizure. There are even dogs that are trained to help someone who experiences symptoms of Post-Traumatic Stress Disorder. To qualify as a legal service dog, it must be trained to do something that directly helps someone with a disability. Such animals are allowed by law to go wherever the general public goes including on public transportation, into buildings and any other place that is open to the general public. An emotional support animal, on the other hand, does not need to have any type of special training. Their job, as defined by the ADA is to “provide companionship, relieve loneliness and sometimes help with depression, anxiety, and certain phobias”. An emotional support animal letter is a document that can be provided by a licensed therapist or mental health professional in San Francisco or in other parts of the United States. This type of letter states that an animal is medically beneficial to the owner. In order to prescribe an emotional support animal, a doctor or therapist must first be willing to certify that someone has a verifiable disability. Then, the person can qualify for special kinds of protection given by the US government. Who Can Qualify for an ESA Letter? Does an Emotional Support Animal Need Training? Unlike service animals, emotional support animals do not need any specific training. Instead, they simply need to help a person to be able to function despite their level of disability. The better trained your support animal is, however, the more tolerant others are likely to be. Can an Emotional Support Animal go Everywhere? Make sure to check the most recent rules for emotional support animals on airlines you may be flying with or any hotels you will be staying in to make sure you bring the correct ESA paperwork. How long is a Support Animal Letter Good For? Emotional Support Animal letters are typically valid for a full year, though be aware that some scam websites say that they are able to offer a letter that is good for a lifetime. ESA letters expire because the diagnosis and prescription must be renewed periodically just like any other type of prescription. Is an Owner Required to Answer Questions about an Emotional Support Animal? Though business owners of all types may be curious about your animal and wonder if it truly has a right to come everywhere with you, there are only two questions they are legally able to ask. First, they may ask if it is a service animal that is required because of a disability. Second, they are allowed to ask what service the animal has been trained to perform. Beyond that, they are legally required to allow the animal to go wherever the general public goes. Does an Emotional Support Animal Need to Wear an Identifying Collar or Harness? There is no requirement that an emotional support animal wear a special harness or collar, though this type of identification may help business owners or others around you to know that the animal is there for your support and not just as a pet. Do I Need to Have my Animal’s Identification Papers With Me at All Times? It is also not required that you carry your emotional support animal’s letter with you all of the time as it is illegal, according to the ADA for anyone to insist on seeing proof of your diagnosis/prescription. Again, at most, people are allowed to ask if your animal is a service animal that is required because of a disability and what service it is trained to perform. Understanding why an Emotional Support Animal letter in San Francisco is important is the first step to making life just a little bit easier. And though there are many internet sites that say they can provide an ESA letter, many are fraudulent. 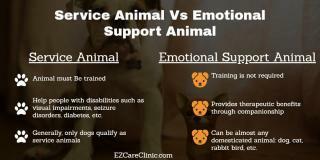 The qualified doctors at EZCare Clinic in San Francisco can help you to get going on the process of legalizing your emotional support animal, so you can be sure to have it with you when it is most needed. Patients may call or schedule an appointment online to get an emotional support animal letter. We also offer an online ESA application, which is legitimate and signed by licensed California doctor. If you think you may need an emotional support animal, no matter where you live, don’t hesitate to reach out. My mother died about 6-7 years ago and I inherited her dog ” Chester”. For the most part I hated that little dude because he was a constant reminder of her demise. Every day for about 2 months i would come home and he would be jumping on me all exited to see me but it bothered me because his simple presence was nuisance to me. I gave him away to another family member and shortly after i began to feel even worse than i did when i had him. I went in to the ezcare medical clinic and i spoke to the dr. about my suspected depression and she suggested i get an emotional support animal. I honestly felt really dumb because i kind of already had that and i gave him away. I called up my cousin and got chester back and went back to the clinic and the physician helped me get my esa letter for him to be able to live with me. Day by day im starting to heal and hopefully chester fills that void i feel deep n my heart for losing my mom. I am really grateful to dr. daniels because i thought maybe meds would be the way to go. this just seems so much better and effective. One of the basic purposes of keeping an ESA is to relieve stress & depression. There are certain situations when someone prefers loneliness to company. The person loses interest in all types of activities. These include eating, working, studies and even respond to a person who is speaking to the affected patient. Experienced mental health physicians like My ESA Doctor, besides prescribing conventional medicines, also recommend the company of an ESA. They also provide 2-in-1 ESA letter for dual purposes use. Thanks for providing valuable information! This is all anyone looking to register his pet as an emotional support animal should know. An ESA letter signed by a popular clinic like Medical Clinic provides you with many benefits. You need not pay hefty amounts as pet deposits to your landlord or to an airline while boarding an airplane. You can get full freedom to live with your pet even if your landlord has a no pet policy. With online services, getting an ESA letter has become very easy and convenient.